"I AM SAM: A YEAR OF INNOCENCE AND ANGUISH AT SAM HOUSTON HIGH SCHOOL"
In Los Angeles County, each day brings peril for the innocent victims living in the crossfire of gang violence. No matter where the bullet finds them, no matter their race or economic status, the trajectory of their lives changes forever. Survivors never recover completely from their bullet wounds and families never get over their loved ones being murdered. They are communities facing lifelong health problems and psychological trauma. For those left behind - mamed victims, husbands, mothers, best friends of the dead - the aftermath is an ongoing nightmare. They spend years struggling against pain that is not only physical but also emotional. When the senseless violence makes the news, it is usually explained as young men killing each other over drugs. Often forgotten are the real victims, whose stories are rarely told, yet which illustrate the genuine human toll of gang violence. Five-year-old Josue Hercules' blood still stains the sidewalk where the stray bullet hit him. Rose Smith can't find the strength to tell her children she's never going to walk again. Shameka Harris wonders why the bullets couldn't have hit her instead of her young daughter. The struggle bends lives in different ways. Some dip into long periods of depression, battling to keep their relationships, their jobs and their hope afloat. Some become activists and work to change laws. Some lack the means to leave their dangerous neighborhoods and are trapped in view of the crime scene. These victims share a special kind of peril - and in the most dangerous parts of Los Angeles, this passes for the norm. "I realized I was shot when my leg started burning and I saw holes in my leg... I was just crying, hoping that the ambulance would hurry up and come." 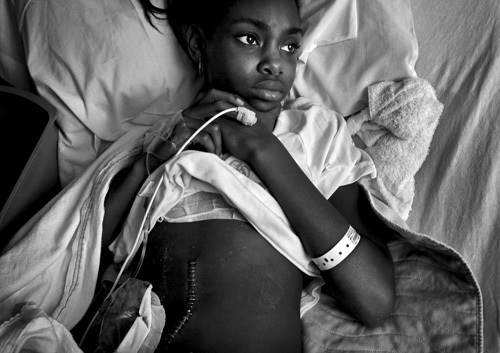 Three bullets tore into 10-year-old Erica Miranda's back, knee, and hip while playing basketball outside her home when a young man walked up to a crowded street corner in Compton and pulled out a handgun and started shooting. Los Angeles County sheriff's investigators believe a 17-year-old relative of her stepfather was the intended target. Both males were shot three times and survived. Erica will not be paralyzed, doctors say. But there is significant nerve damage in her right leg.